A gun metal bolt action with the rattlesnake and "Don't Tread on Me" motto from the Gadsden flag imposed on the Army of Northern Virginia battle flag. 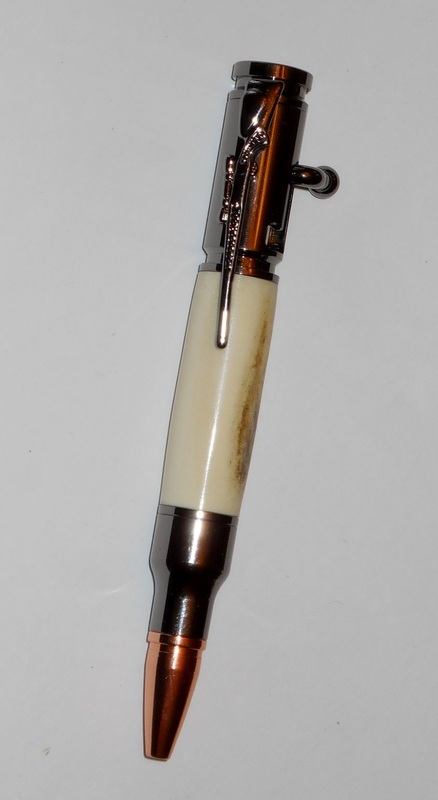 Harley-Davidson 1965 stamp from the American Motorcycle series, on a gun metal bolt action pen. Indian 1940 stamp from the American Motorcycle series, on a gun metal bolt action pen. 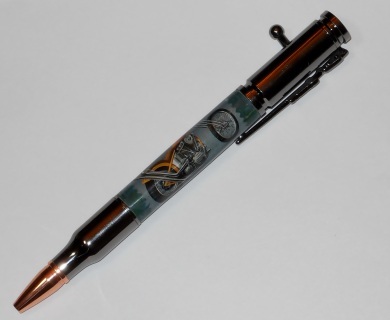 Chopper 1970 stamp from the American Motorcycle series, on a gun metal bolt action pen. Cleveland 1918 stamp from the American Motorcycle series, on a gun metal bolt action pen. 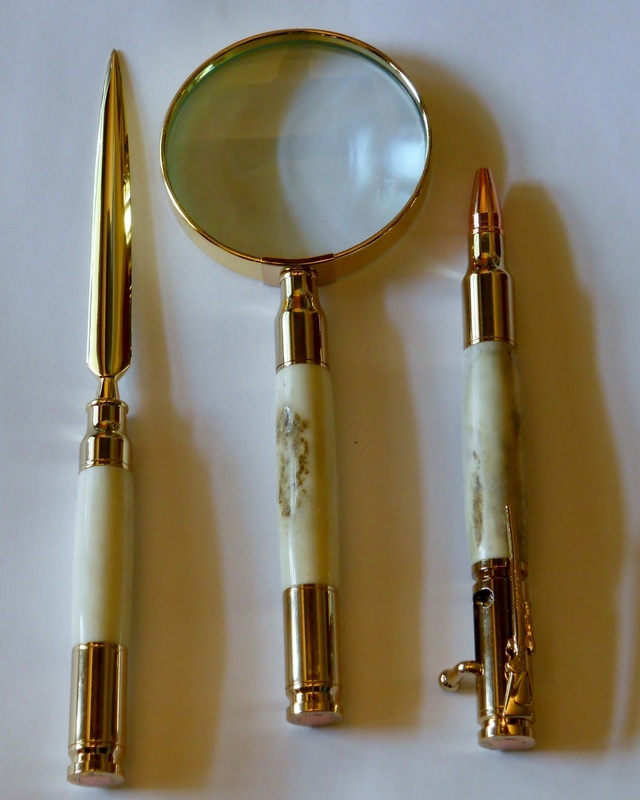 Desk set for the outdoorsman - bolt action pen, letter opener and magnifying glass - all in gold plate finish and with turned antler bodies. 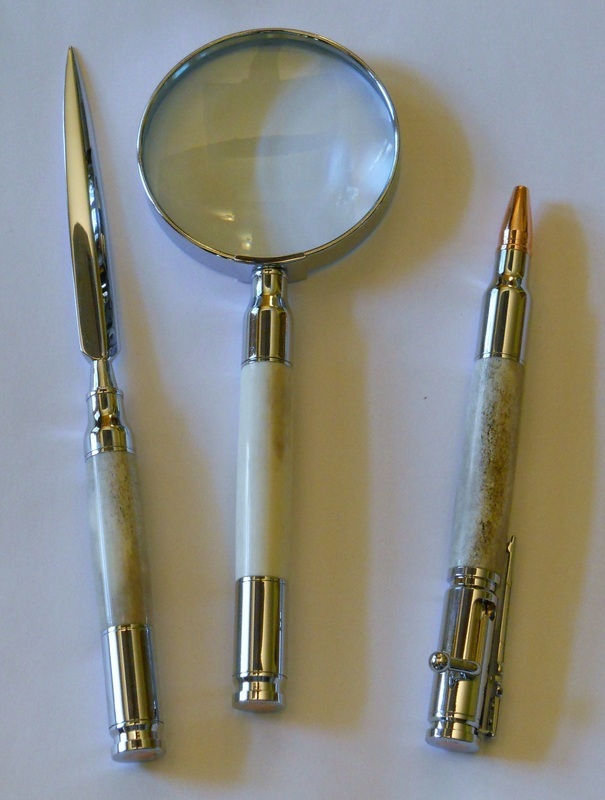 Desk set for the outdoorsman - bolt action pen, letter opener and magnifying glass - all in chrome and with turned antler bodies. Desk set for the outdoorsman - bolt action pen, letter opener and magnifying glass - all in gun metal finish and with turned antler bodies. Hand turned and polished white tail deer antler with a durable hard acrylic finish. 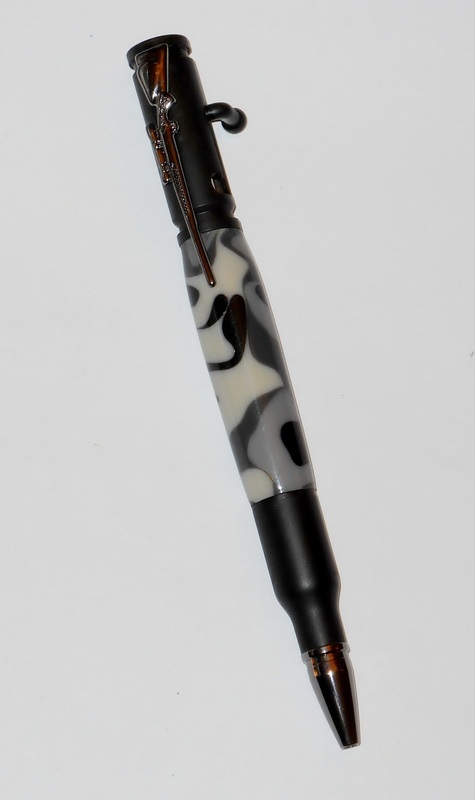 This pen is made from a block of acrylic in a pattern of crushed whites mixed with touches of grays and black in a camouflage pattern. This pen is made from a block of acrylic in a dark brown, tan, and dark green camouflage pattern. 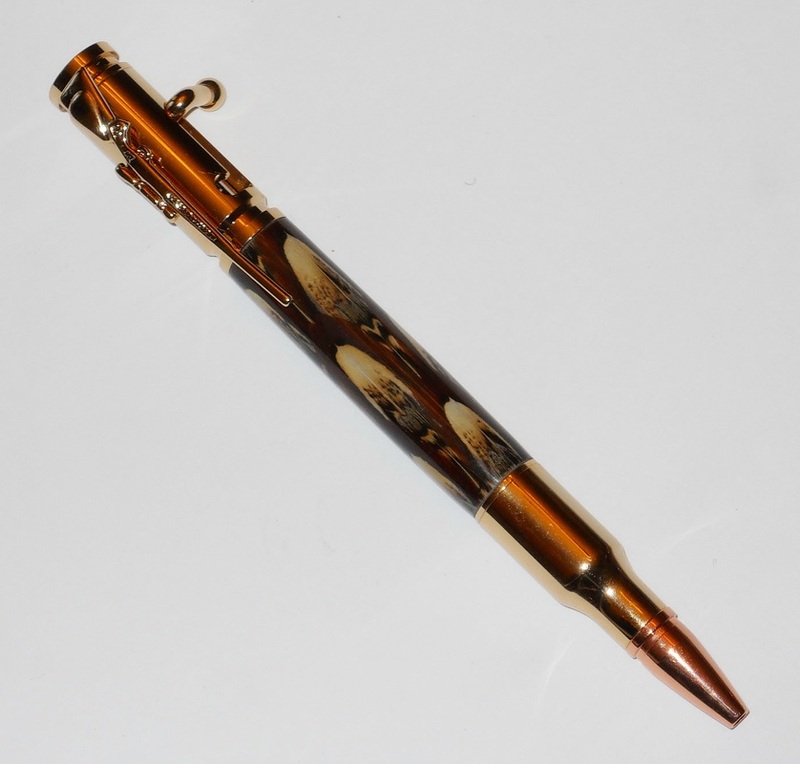 This pen is made from a block of acrylic in a brown, tan, and light olive camouflage pattern. 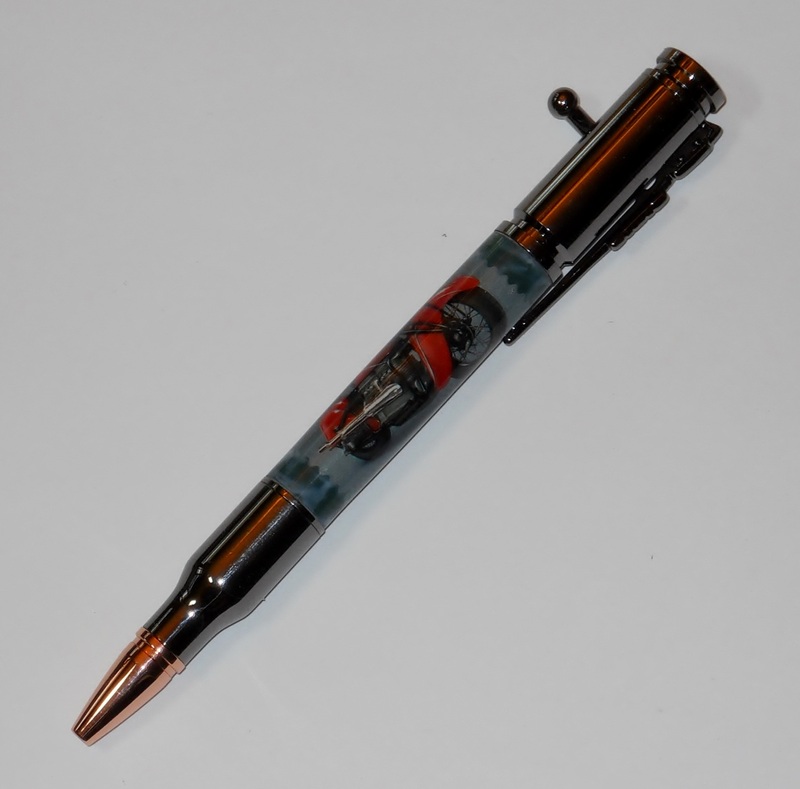 This pen is made from a block of acrylic in a black, brown, yellow and gray camouflage pattern. Hand turned and polish blue mahoe wood with a hard durable acrylic finish. Blue Mahoe (Talipariti elatum) is native to Cuba and Jamaica. It is the native tree of Jamaica. The blue refers to blue-green streaks in the wood. 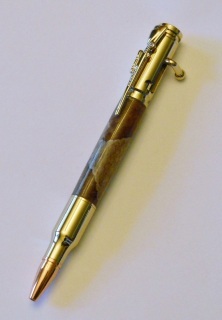 The mat black "Black Ops" pen in Indian Rosewood Burl. 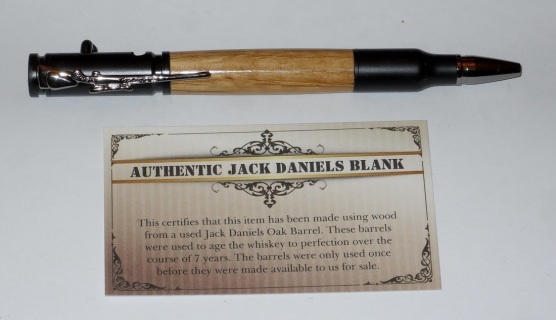 The wood for this pen was diverted from the municipal dump in St. Petersburg, Florida. This pen is made from a block of acrylic in a black, grey, and white camouflage pattern. 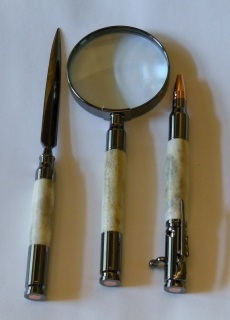 Gun metal miniature bolt action pen with deer antler. 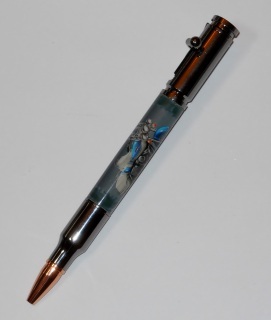 This pen is 4" long and takes a miniature refill. Right hand (backward bolt) version shown. These can also be oriented like a real rifle bolt by special order. 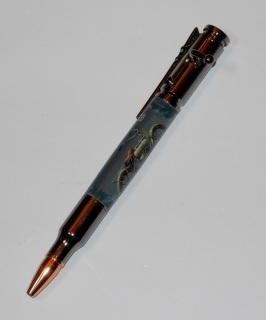 Copperhead snake skin cast in clear resin and hand turned on a gold plated bolt action pen. 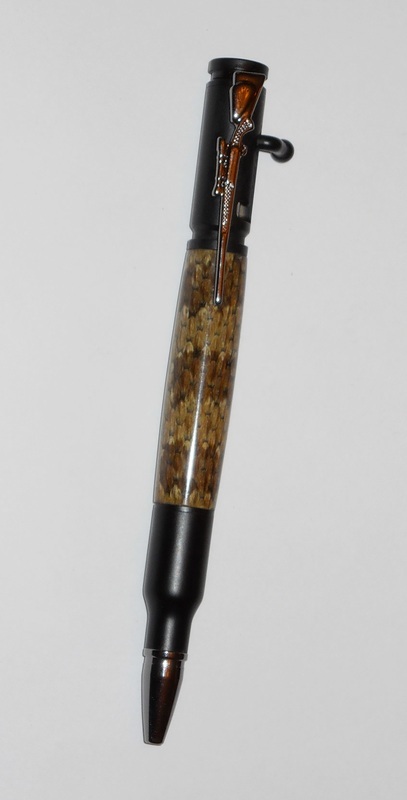 Wyoming prairie rattlesnake skin cast in clear resin and hand turned on a black bolt action pen. Wyoming prairie rattlesnake skin cast in clear resin and hand turned on a gun metal bolt action pen. A new miniature version of the wildly popular 30 Caliber bolt action pen. This pen is 4" long and takes a miniature refill. 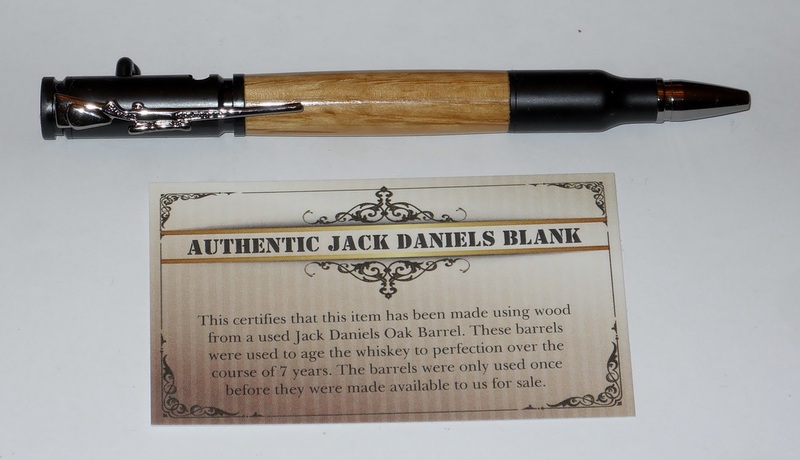 This pen in gun metal finish is made from a piece of wood cut directly from an original Jack Daniel's® Barrel which was used to age one batch of whiskey. A certificate of authenticity is included with each pen. 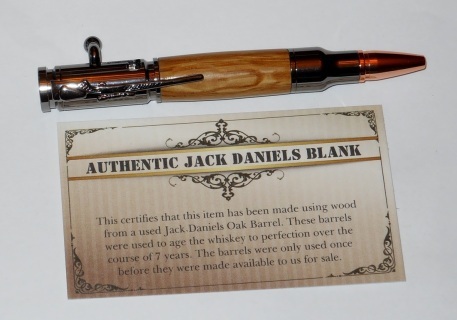 The ultimate gift pen for the hunting or outdoor enthusiast! 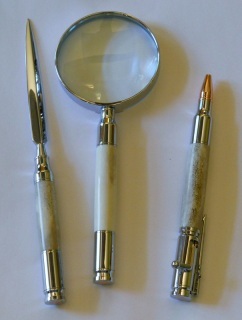 Individual ringneck pheasant feathers are carefully placed on a brass tube. 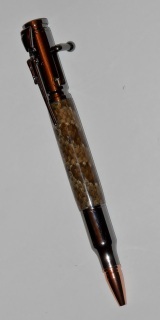 The tube is then carefully cast in clear resin to preserve and magnify the beauty of the feathers. 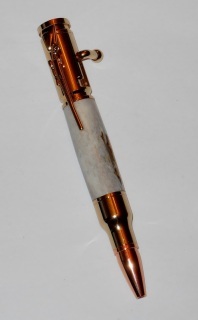 The tube then becomes part of a Gold plated bolt action pen pen. Every pen is a work of art and as individual as the feathers from which it is made! 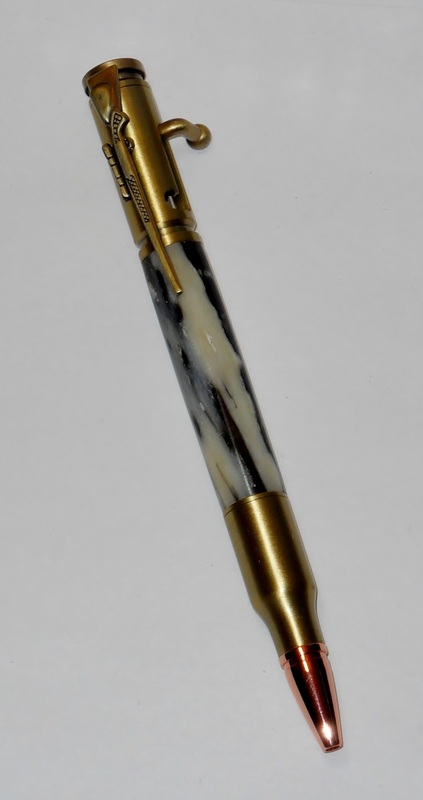 Alligator jawbone, dried, and cast in black resin with just a touch of brass, then drilled and hand turned on the lathe, and on an antique brass bolt action pen.